The MixRite 566AG injector is designed for a wide array of chemical and other additives. 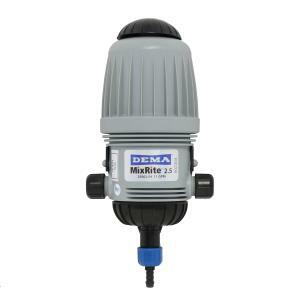 Accommodates water flow up to 11 GPM. MixRite Water Driven Injectors are water powered proportioning pumps that require no electricity and deliver accurate dispensing across varying water pressures and water flows. These units are ideally suited for in-line injection. MixRite injectors can provide in-line addition of fertilizer, insecticides and pesticides for agriculture and irrigation, dosing of livestock vitamins into the water supply plus many more uses. Includes suction tube with foot strainer and hose clamp and a replacement seal kit.